One way to execute a VBA macro in Excel 2016 is to press its shortcut key. But before you can use this method, you must assign a shortcut key to the macro. Choose Developer →Code → Macros. Select the Sub procedure name from the list box. In this example, the procedure is named ShowCubeRoot. Excel displays the Macro Options dialog box. 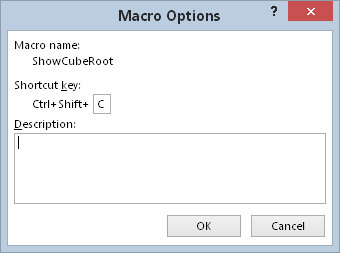 The Macro Options dialog box lets you set options for your macros. Click the Shortcut Key option and enter a letter in the box labeled Ctrl. The letter you enter corresponds to the key combination you want to use for executing the macro. For example, if you enter the lowercase letter c, you can execute the macro by pressing Ctrl+C. If you enter an uppercase letter, you need to add the Shift key to the key combination. For example, if you enter C, you can execute the macro by pressing Ctrl+Shift+C. Click OK to close the Macro Options dialog box and then click Cancel to close the Macro dialog box. After you’ve assigned a shortcut key, you can press that key combination to execute the macro. A shortcut key doesn’t work if it’s assigned to a macro that uses an argument. The shortcut keys you assign to macros override Excel’s built-in shortcut keys. For example, Ctrl+C is the standard shortcut key to copy data. If you assign Ctrl+C to a macro, you can’t use Ctrl+C to copy. This is usually not a big deal because Excel almost always provides other ways to execute commands.